5 Best Practices for Better Sales Performance & More Wins! 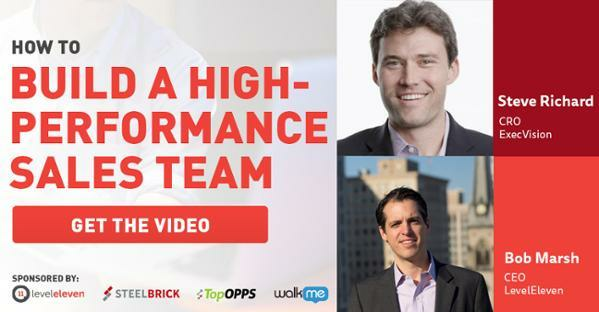 What separates a top-performing sales person from the rest of the pack? I know I’ve asked myself that question many times. In a lot of cases, it’s because they dedicate time to personal and professional development. And as they do that, they get in a lot of practice. Over the past 7 years, I’ve been fortunate to participate in many sales methodology and training programs. After many of the earlier sessions, I expected to see an automatic improvement in my sales performance without having to actually dedicate additional time to practicing what I learned. Today, I know that’s ridiculous. Like my baseball coaches, university professors and yes, mother (good ole’ Mary Ann) used to consistently say: Practice makes perfect. We’ve all read the research that shows how training changes the brain to improve performance. Oftentimes this is talked about in reference to athletes, but it goes for salespeople, too. To perform at a high level, consistent training needs to take place. Here are five best practices that consistently lead to higher sales performance. Put them in play, and you’ll be on your way to more wins. Take time weekly to understand new trends and markets. Google Alerts is a great technology that allows you to track certain topics, companies or people across the internet. You can set up alerts to stay in the loop with what your competitors are doing, follow leaders in your industry and see what your prospects are up to. I dedicate my morning commute to practicing things like our go-to-market messaging or even prospecting calls to different personas. Give this a shot, and be sure to record yourself on your iPhone as you do. Start by making a commitment to do this each morning for 30 days, and you’ll be surprised by how much your delivery improves. Sales teams and professionals who are consistently known for being top performers are always investing in themselves. Consider trying out a training session like that offered from Harris Consulting Group or LinkedIn’s Sales Navigator. Then, as you take ownership of your own education, make sure to keep practicing what you learn. Think about a goal that you and your team were most effective in achieving. There’s a solid chance that you had some critical initiative you needed to achieve in a short period of time. As you’re goal setting, keep that in mind. Give yourself short deadlines, and watch how much more effectively you focus on those goals. So, we talkin’ about practice? Yes Allen, we’re talking about practice — starting with these five things. Ever see the Allen Iverson clip about practice? Sales tip: Increase sales performance by taking the opposite route.